The butterfly emerging from the chrysalis represents the metamorphosis of the soul. 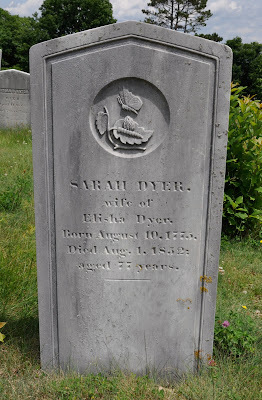 I have seen this motif before — there is an example from 1831 at Mount Auburn and from 1798 at the Central Burying Ground in Boston. The Mount Auburn butterfly looks a little careworn in comparison to the Castine butterfly. I don't know if it's a matter of the quality of the marble or of the elements, but this carving is remarkably sharp and detailed. The veins of the leaves and the intricate designs on the butterfly's wings are barely worn at all.